Imagine if all your choices were gone. And it's the only one that really matters. The last thing Mia remembers is the music. After the accident, she can still hear it. And she can see her damaged body being taken from the wreck of her parents' car - even though she can't feel a thing. All she can do is watch as doctors rush to save her life, as her friends and relatives gather outside her room, as the boy she loves struggles to be near her. As the next twenty-four hours unfold, Mia must come to terms with what came before the crash - and what could come after. And she knows she must make the most difficult choice of all. My thoughts: Even though tragedy strikes, If I Stay is not a novel about death but about life. The story unfolds in two parallel levels: the present where Mia is in the hospital after the accident and the past, where through little snippets of flashbacks we get glimpses of Mia's life and memories. All the small, seemingly ordinary moments of her life, but which are truly the ones that one remembers when looking back on their life: the family barbeques, goofing around with her little brother, her first date and kiss and how she became best friends with Kim. Gayle Forman's writing flows naturally and Mia's reminiscing has you turning the pages while losing all notion of the outside world and time. One of the highlights of the novel are the strong characterizations: even the supporting characters leap off the page and the reader will remember even those minor characters who only made one chapter appearances (like Kerry and his unforgettable funeral memory). The novel is narrated by Mia, who is a very serious young girl, more mature than her 17 years would let one presume. She is quiet but intense, focused and dedicated, loyal and genuine. She feels a bit out of place in her family as she has dark hair and eyes while her mom, dad and brother are all fair in colouring, they like rock and punk music while she is a classical music lover; but despite this sense of sticking out she deeply loves her family and feels best while with them. All the family scenes are fun and moving: the quiet affection and love shines through and it is clear this family has a great time even when doing mundane things. Mia's parents are "cool parents": her dad was a musician and songwriter in a band until Mia's little brother was born and her mom was a rebel music fan/hippy, but even since they became "grown up parents", they kept this young, rebel, cool side of them and are still young at heart. All the light, funny banters in the car, at dinner, in the garden give a sense of this family better than any lengthy description could. What I loved was how in spite of the shortness of the novel, If I Stay managed to show all the different facets of Mia's life: her life with her family, her grandparents, her best friend Kim, her boyfriend Adam and then of course with her great love: music. Mia's relationship to all these sides of her life was presented and laid out and the reader got a picture of what made Mia Mia. And I loved how these different facets of her life got equal importance and "screen time", that her friendship with Kim was not downplayed to leave more room for the love story with Adam, but rather how these different sides of her life were all interwoven. I cannot highlight one part of the novel I liked better than the other, because Mia's love story with Adam was beautiful and touching, her friendship with Kim was funny and cute and her relationship with her parents and her little brother was heartwarming. If I Stay is a wonderfully written and structured novel. All the flashbacks are meaningful and important, they have a role to support the present and show the reason behind Mia's indecision, feelings and doubts. Verdict: If I Stay is a novel about choices, about decisions, about love. Because it is love that will ultimately sway the balance and make Mia decide either way. 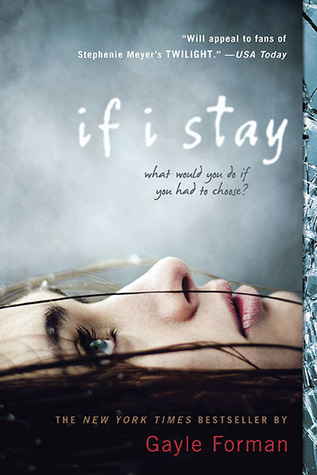 If I Stay is a moving and deep novel, and through the sad and heartbreaking loss of Mia it will still manage to make you feel alive and happy. So imagine how happy I was when I saw that Gayle Forman is planning the sequel! Here is what she had to say about it: "It’s called WHERE SHE WENT. It takes place a little more than three years later and it’s told from Adam’s point of view. And that’s all I’m saying. It will come out in the spring of 2011 from Dutton." I became an official Book Lover!! Read Your Own Books Read-a-Thon - Join our ranks! Why have I been so quiet lately? Winner of Promise by Kristie Cook!